I’ve always shopped in the markets in different countries I’ve lived, or if I go to visit a new country, I make a b-line for the market to learn more about where I am through what’s available to eat. 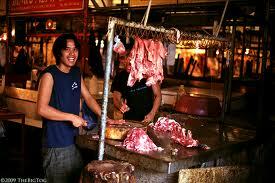 As all market lovers know, its usually the best place to get the freshest food at the cheapest prices. One of the challenges of living in Manila for me has been the strong lines of distinction that exist between expat shopping and local shopping – that’s geographically, product availability, and prices. Its not that we can’t shop in local markets, its just that after the first few months of making the effort to do so, it became more and more of statement rather than a practical way of getting in supplies. It just isn’t easy. There aren’t any within easy reach and people who live in upscale areas (like us) simply have a full-time cook and maid to do it for them. Or they order from fancier grocers. The rents are sky high here too, which makes it unaffordable for retail outlets to sell everyday items. So I was glad to have the opportunity to go market shopping last week with a couple of filipina helpers from Embassy families who were helping us with the food for the Community Welcome party menu. 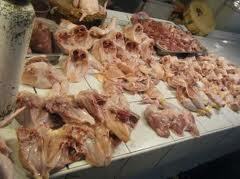 The first stop was a meat market in Pasay where we stopped to buy chicken and pork. I’ve been to these markets before. If you haven’t experienced the world of raw meat without refrigeration, stainless steel and gloves, it can come as a bit of a shock. 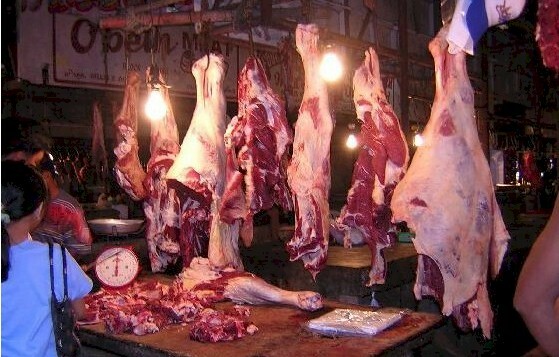 At each vendor, all parts of the dissected carcasses are piled — by body part — in large piles next to each other. Aside from the usual cuts of breast, thigh, wing etc., you could buy chicken feet, necks, blocks of chicken blood (for bbq I learnt) and various cleaned innards. Scrap bags were also for sale, containing odd trimmings, bones and discards from other sales for the poorest customers to make a broth. Price was by negotiation, always. Our cook haggled in Tagalog at several different vendors for 6 kilos of chicken, and finally settled on one that gave her the best price. This guy however gave her a hard time. He didn’t want to let her pick the individual wings and wanted to pour the raw “juice” in the tray onto the scale to include it in the weight. She gave up on him in disgust and found a more helpful vendor who worked with us to prepare the chicken order. It took quite a while and my eyes strayed around me to watch all the different scenes going on. Butchers carried whole pig carcasses over their shoulder. Customers rummaged through the raw meat on display like they were picking through the sale rack at Nordstroms – arm deep in different choices – seemingly unaware that they were handling raw meat. Across from us a chicken vendor was piling cooked rice on half a dozen battered metal plates. I wondered what he was up to until I notice a single burner and saucepan bubbling below the counter. He’d been throwing meat scraps into the pot and was now ladling chicken bones and broth on to the rice plates. Breakfast for the workers, I guess. You would have to be very hungry to find it tasty, so I was in no position to judge. I would shop here if it was easier and I had a little more time and training from a local. You’d need to know who the better vendors were and learn how not to pay the expat premium prices. Its not a realistic option this time around though. Hope I can crack that nut in Nepal.